Skip recently purchased a brand new 31 Catamaran Center Console from Renaissance Prowler. After making a substantial purchase, Skip started researching to find a professional ceramic coating to help protect his investment. Skip used the popular boating forum, The Hull Truth, where boat owners across the country share their experiences and feedback about anything and everything related to boating. 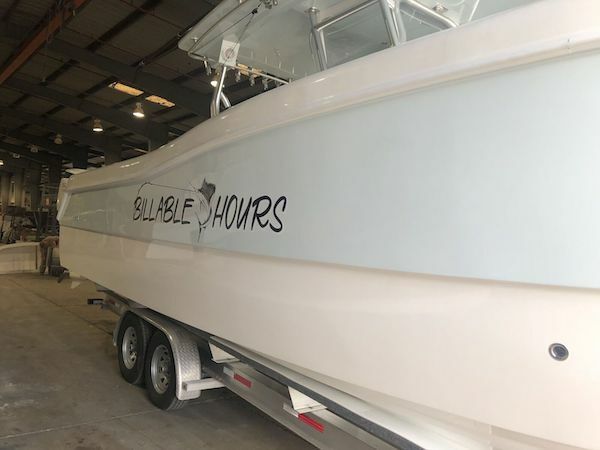 He came across Glidecoat on The Hull Truth, with several members discussing their positive experiences with our ceramic coating and how it has helped properly protect their boats. 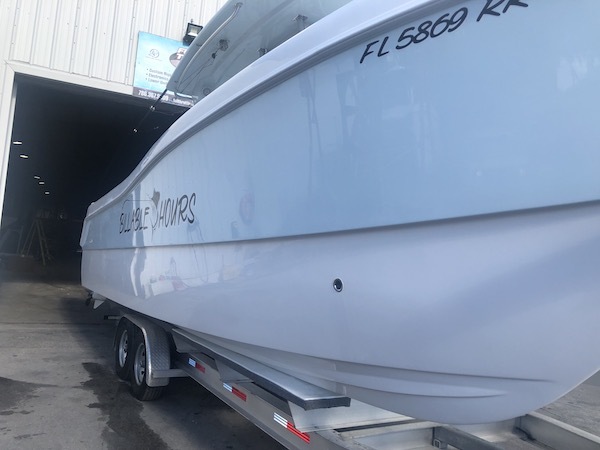 Skip reached out to us directly to have us apply our professional ceramic coating on his 31 Prowler Catamaran at the factory before taking delivery of his new boat. 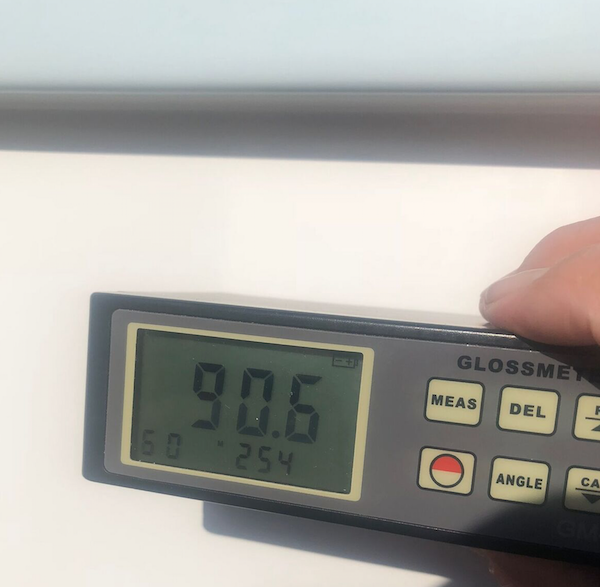 On the hull of the Prowler 31', the gloss meter readings registered at 70.4 before we started the professional ceramic coating process. Before starting the professional ceramic coating process, you can see the shine of the hull and the baby blue color. The owner wants to boost the shine and maintain that gloss moving forward! With our professional ceramic coating application process, the preparation is key! The coating is designed to enhance and protect the surface to which it is applied, so the boat must be prepped to the best condition possible. The boat was due to be delivered to the client and remained at the manufacturer's facility in Opa-locka, FL. Considering the facility is fully operational with dust and other particles in the air, the first step was to wash the entire boat with Nano Wash, and remove any dirt from the surface before polishing. Once the hull was completely washed and dried, we then started the process of polishing the hull and topside to increase the gloss meter readings. We then polished all flat fiberglass surfaces, both on the hull and the topside. This step was necessary to remove any residual mold release wax, while eliminating any surface imperfections and improving the shine. Immediately prior to applying Glidecoat’s professional ceramic coating, we used our Surface Wipe to decontaminate the surface. The Glidecoat Professional Coating is a five stage process completed by our certified applicators in a controlled environment. After an initial assessment of the boat, we get started washing and preparing the boat and carefully apply the exclusive line of Glidecoat products. The Professional Coating process completely restores your boat’s surface and offers the ultimate protection available. We start by pouring a dime sized amount of our professional ceramic coating onto the red application sponge. Working in 2’ by 2’ sections, we apply our coating onto the surface. When applied the surface will appear to be “sweating”, we then buff the area with a clean microfiber cloth, working the coating into the pores while removing any excess liquid from the surface. This process is completed across the entire boat. Once the first coat is completed, we repeat this step and apply a second coat of the professional ceramic coating. The boat looks awesome! Thank you!!!" Once the coating had fully cured, between 8-12 hours, the result is nothing short of amazing - 90.6! At the beginning of the Glidecoat process readings registered 70.4. The gloss and shine increased by nearly 25% from factory new readings! After allowing the coating to cure 8-12 hours we again used the gloss meter. 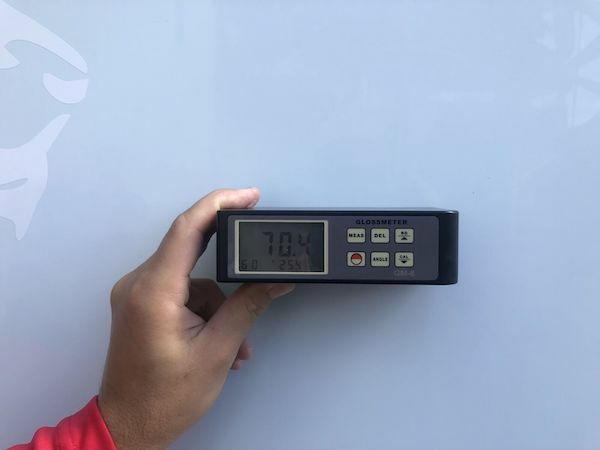 Now readings had climbed from the 70.4 to 90.6 after completing the four (4) step process and applying our professional ceramic coating. Our professional ceramic coating will protect the boat for 18 months here in South Florida! Enjoy Skip! !